NFI Code Enforcer - Property Management Application is an integrated code enforcement and certificate issuing application. 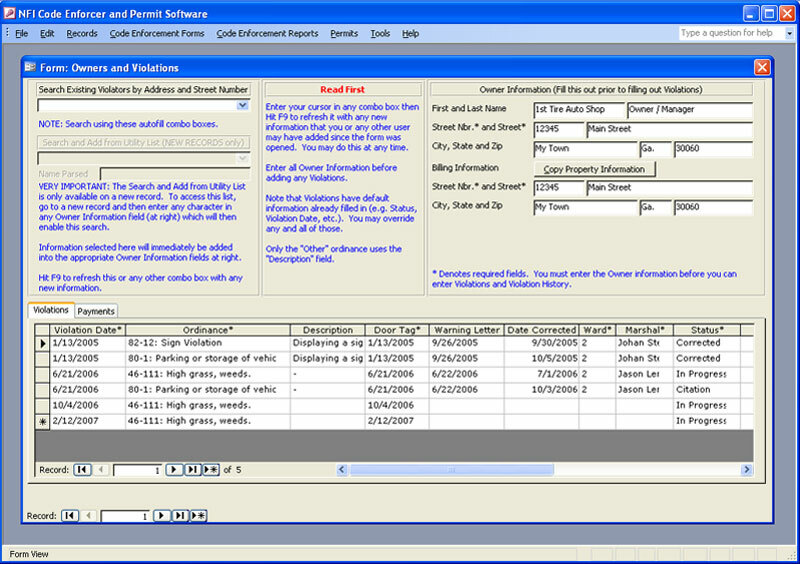 The software is an excellent tool for city governments, county governments, state governments or other governments. It can also be used by Housing Complexes, Apartment Complexes and Condo Associations. It gives you the information you need when you need it with the greatest ease of access. Owners and Violations form: Powerful search by street name lets you focus on the street name and then the street address. Search through existing violators. Use may also use GIS, Excel, CSV or other lists of your city's or county's source list of home owners and renters when adding a new record. Detail from the bottom of the Owners and Violations form. All of the Violations at a given location are easy to find and view at a glance. It is also easy to sort, filter, copy and paste making data entry easy and error free. One can hide, show or freeze columns or even move them around. This allows the Users to customize their own environments without affecting other Users. Data entry is often through easy to use drop boxes making data entry fast, accurate and easy.